Yesterday March 27, Iain Parnell and Greg Boswell made the second ascent of Ship of Fools (VIII,7), high up on Indicator Wall. This quintessential thin ice route takes a series of very thin ice grooves (30 cm wide in places) just right of Riders on the Storm and is one of the most serious routes on Ben Nevis. I was astonished by Iain Small’s bold lead of the hollow wafer-thin ice on second pitch during the first ascent in 2007. Later in Alpinist magazine I wrote that I’d just “witnessed one of the finest leads in Scottish ice climbing history”. Ian Parnell was unable to climb the thin ice as Iain had done, but he managed to find a difficult mixed alternative just to the right. After this the pair continued up the original line to bag an important second ascent. For collectors of climbing trivia, the route was so named because it was climbed on the 1st April! For more pictures see Ian’s ianparnellphotography.blogspot.com and Greg’s gregboswell.blogspot.com blogs. Conditions have been good on Indicator Wall, although most teams have focused on the Orion Face. On Saturday March 20, Iain Small and Tony Stone made the third ascent of the Rhyme of the Ancient Mariner via the Parnell-Scott Direct Start (VII,7). Today, Robin Clothier and Nick Harper linked the Right-Hand Start to Albatross, with sections of Rhyme to finish up a hanging groove just right of Albatross. Although this route covers little new ground it provides another way up the wall. “Like all the best winter lines, it misses out all the steep bits!” Robin explained afterwards. Fascist Groove (VI,6), the left-hand start to Albatross , was also climbed today. 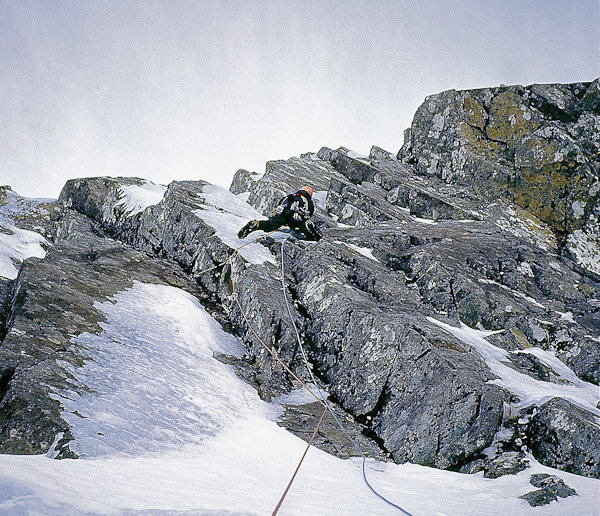 This may be the second ascent of this rarely iced pitch that was first climbed by Roger Webb and Chris Rice way back in February 1983. This entry was posted in Repeats and tagged Ben Nevis, Greg Boswell, Iain Small, Ian Parnell, Indicator Wall, Nick Harper, Robin Clothier, Tony Stone. Bookmark the permalink.